Sleepy Hollow never was a must-see show of mine, in fact supernatural horrors generally don’t interest me, but this third season at least offers some decent stories and fine performances by Tom Mison and Nicole Beharie. 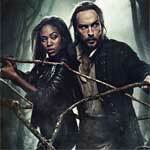 Nine months after Abbie Mills (NICOLE BEHARIE) and Ichabod Crane (TOM MISON) parted ways, they reunite when Abbie, now an FBI agent, returns to Sleepy Hollow to release an imprisoned Crane. The two Witnesses face all-new dangers, including a demon that kills anyone with a dark secret, an undead army, and a horrifying beast with ties to Jenny Mills. But the arrival of a mysterious woman named Pandora brings the most terrifying thread of all. After she uses Abbie and Crane resurrect “The Hidden One,” a seemingly invincible god, the fate of the world hangs in the balance. Unfortunately, Sleepy Hollow continues the trend (by Fox and Paramount primarily) releasing their TV series initially on Blu-ray before dumping the format for the DVD route. Worse yet, seasons one and two came with a plethora of features, not so this time getting only some Deleted Scenes and Outtakes. Shame, but not unexpected. 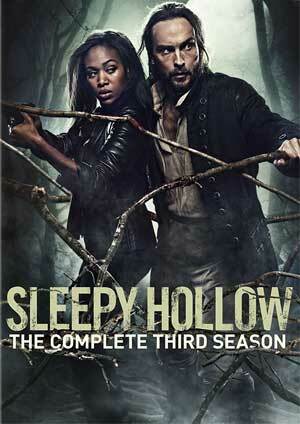 Sleepy Hollow: The Complete Third Season is presented with a 16×9 enhanced widescreen 1.78 aspect ratio and comes with a basic but effective enough Dolby Digital 5.1 track. Neither are amazing and a step down from the previous seasons, but probably match up to how it aired. Overall, Sleepy Hollow never was a must-see show of mine, in fact supernatural horrors generally don’t interest me, but this third season at least offers some decent stories and fine performances by Tom Mison and Nicole Beharie. This DVD released by Fox, however, was disappointing; the video and audio transfers in themselves are fine but this third season you’re getting far less than the previous two not to mention standard def video and audio.